I knew I was in strong hands even before I'd opened the mailer containing The Frugal Book Promoter by Carolyn Howard-Johnson. Affixed to the mailing envelope was a very large address label which contained tiny thumbnail images of several of Howard-Johnson's books. As the clever label showcase suggests, The Frugal Book Promoter's author is very thorough. Weighing in at 416 pages, the book is meant to be a broad survey of twenty-first century book promotion opportunities, covering both fiction and non-fiction. The ideal reader is a motivated author who has already learned a bit about the subject, who could yet benefit from a good primer. For example, if you've read enough to know that you may need a "media release" and "media kit," this is the book which will tell you precisely how--and why--to write one. The tone of the book is that of a knowledgeable aunt who has been around the block frequently enough to have thought the journey through. Dozens of promotion ideas covered: retail opportunities, conferences, media interviews, awards. 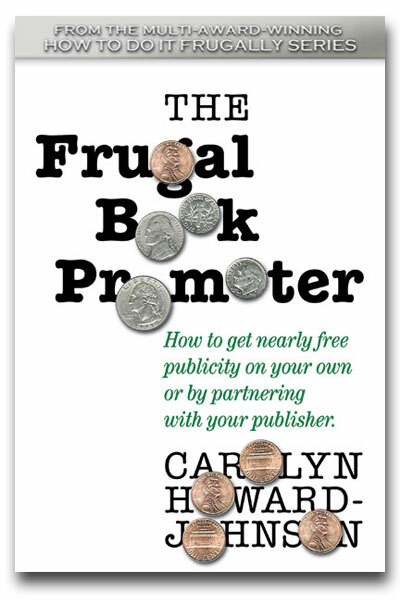 The first part of The Frugal Book Promoter helps an author frame her thinking around what book promotion can and cannot accomplish. I particularly enjoyed the short chapter about whether or not to hire a publicist, and also the chapter on being interviewed, and how to be a good radio/TV guest. Because the book tackles so many subjects at once, however, every chapter is short. This book is the #101 survey course, and I sometimes found myself wanting to know more advanced details before I was swept on to the next topic. If you'd like to peruse the universe of book promotion ideas, this book is for you. Disclosure: I received a copy of The Frugal Book Promoter when I expressed the desire to review it. You can find more about Ms. Howard-Johnson at www.howtodoitfrugally.com. The book is $17.95 in paperback on Amazon or $9.95 as an e-book. Sarah, this comes with thanks for your review. Late? I've seen later. And as you might say, "A Review is a Review." Though this one is better. You're welcome! Thank you for reading, too! This does sound like it would be useful. There are SO MANY books out there about book promotion, one hardly knows where to start. Even if this doesn't have all the details, perhaps getting an overview like "The Frugal Book Promoter" provides *is* that starting point. For example, if you've read enough to know that you may need a "media release" and "media kit," this is the book which will tell you precisely how--and why--to write one. Is it more geared to self-published authors? Isn't the media release and 'media kit' usually 'taken care of' by the publisher? It sounds like a very interesting book with plenty to think about. Quick question -- for debut author about to attend (not present) at writing conference what sort of 'kit' (if any) should I take along -- book marks, business cards? Hi Claire! Is this book geared more toward self-published authors? Some chapters are, particularly the ones dealing with approaching retail outlets. A traditionally published author wouldn't do that. Yet creating a media kit is something that traditionally published authors surely may need to do for themselves. Yes, your in-house publicist will create some materials about you. But as time goes on, those items may not be as flexible and thorough as you'll require. For a conference, business cards are a must, because you'll meet people there with whom you'll want to follow up later. A postcard is good too, especially if you have cover art for your book, and reviews or blurbs which can go on the back. Mmm. OK, interesting point about the publishing kit. And it looks like I need to sort out some business cards then! I like the idea of a postcard, thanks! Not sure if it won't be a bit of a rush as my cover art is 'getting there' but not quite ready, but maybe for next time. I was just on goodreads and I noticed a book coming out in January has already been reviewed by many book bloggers. Previously, we talked about the 'blog tour' coming after publication when people can actually buy the book, so I'm just wondering how all this early reviewing fits in? Have you got any good posts/ references on the ARC process? --What the publicist does when and what the author should/ shouldn't do in addition? Thanks again Sarah. Great blog! Glad this 415 page tome is available in digital format!